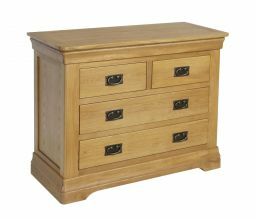 The Farmhouse Country Oak 2 over 2 chest of drawers is hand made my skilled joiners exclusively for Top Furniture. Lowest UK price guaranteed, we wont be beaten. Delivered FULLY ASSEMBLED. 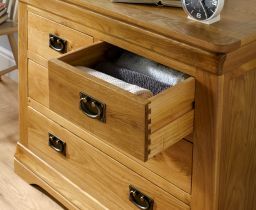 All drawers come with the classic dovetail joints for extra strength and durability and the premium grade oak timber is finished with an oiled wax to show off the grain of the sustainable American oak. 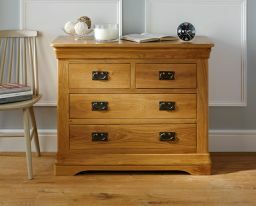 We are confident that this is the best value for money oak bedroom furniture range in the UK. Find it cheaper? Please let us know..
Dimensions: W 955 x D 415 x H 775 (mm) - Available to view in our Uttoxeter, Staffordshire and Dartford, Kent shops. 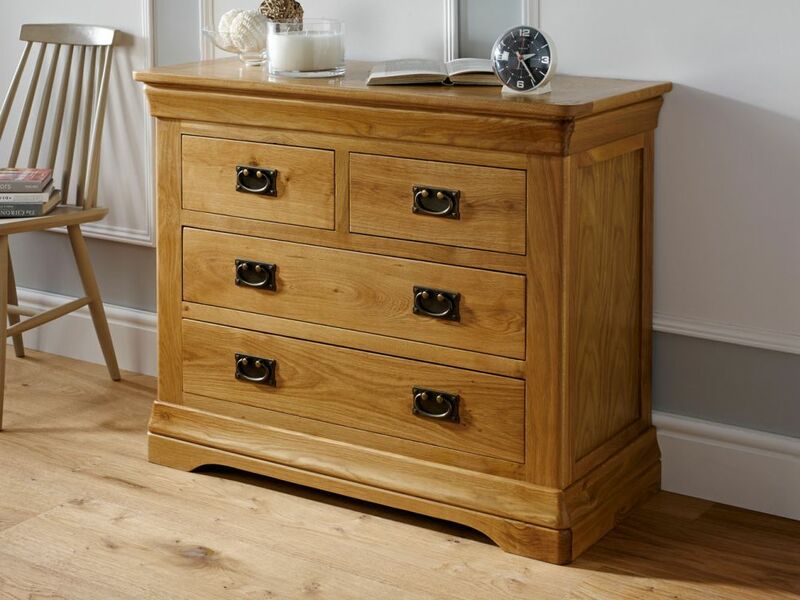 A well-made, very attractive chest of drawers. The colour is slightly more orangey than I would have liked so it's not a perfect match for the existing oak furniture in the room but it still looks good! bought from top furniture twice now, absolutely beautiful furniture, great service delivered on the date asked, will definitely recommend to friends, great value for money too. thank you. 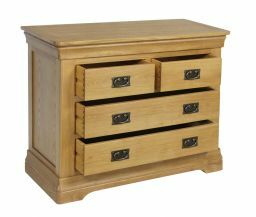 Very pleased with this chest of drawers.Looks good and is well made.Cost is very reasonable compared with other makers.Arrived two weeks after ordering. Looks really lovely and is an excellent piece of furniture for the price. Lovely piece of furniture. Solid and very well made. Delivery was quick and arrived at the time given. Thank you. This is my third purchase from Top Furniture and the quality of the oak is exceptional. From placing the order to delivery I was updated regularly and the service I received was very good. 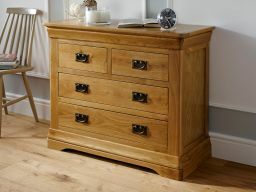 Very good quality at a price that is nearly half the price of an equivalent product at Oak Furniture Land. Makes you wonder what mark up they are making. Very good looking and well made piece of furniture. Good value for money compared to other furniture retailers. As with most deliveries - just a shame can't get after work hours - but great service and product. Staple protruding from back of the unit cut my finger while unpacking.